This is a sponsored post all thoughts, opinions and love of Mutts is my own. When I first got Bailey I remember seeing the Mutts comic in the Sunday paper. I loved the fun, whimsical look at life through the eyes of Earl and Mooch, the Mutts. The Mutts comics always managed to find a way to make me smile and laugh. They are always my go-to Sunday morning comic strip. Now you don’t have to wait till Sunday morning to get your Mutts fix. The Mutts Winter Diaries is filled with comic strips that show you what adventures the Mutts are up to this winter. Reading through the book I love how relatable the comics are. One of my favorites is when one of the Mutts panics when the first snowflake of the season falls and declares it a blizzard. And if you live where it snows I’m sure you know at least one person who acts like that. 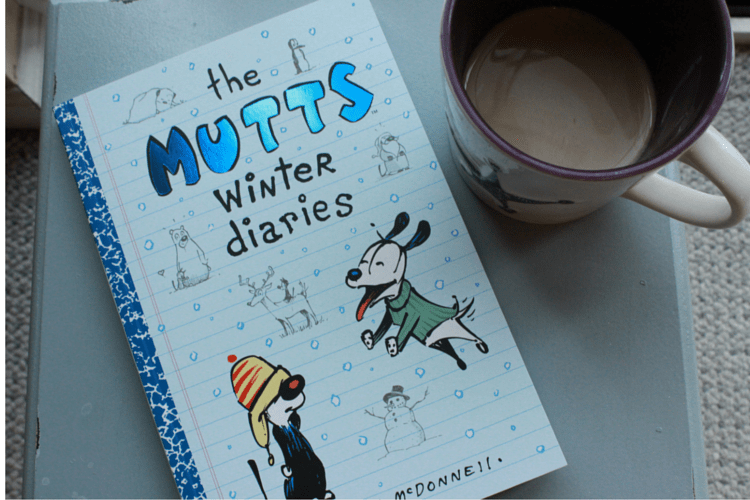 the Mutts Winter Diaries, a great comic to share with kids. In 1994 Patrick McDonnell created the comic strip MUTTS, which now appears in over 700 newspapers in 20 countries. MUTTS has been described by Peanuts creator Charles Schulz as “One of the best comic strips of all time.” McDonnell has received numerous awards for this strip, including the National Cartoonists Society’s highest honor, The Reuben, for Cartoonist of the Year. MUTTS also won awards for its environmental and animal advocacy: two Genesis Awards from The Ark Trust, The HSUS Hollywood Genesis Award for Ongoing Commitment, the PETA Humanitarian Award, and a Sierra Club award. McDonnell is involved with many animal and environmental charities, and is a member of the board of directors for both the HSUS and the Fund for Animals. His characters have been enlisted by the U.S. Marines for their 2006 Toys for Tots holiday poster, the American Library Association’s 2007 “Read!” poster, and by the HSUS for their humane postage stamps. The MUTTS characters appear on the New Jersey Animal Friendly license plates that fund state pet population programs. A fact that I did not know but now I’m going to be on the look out for these. 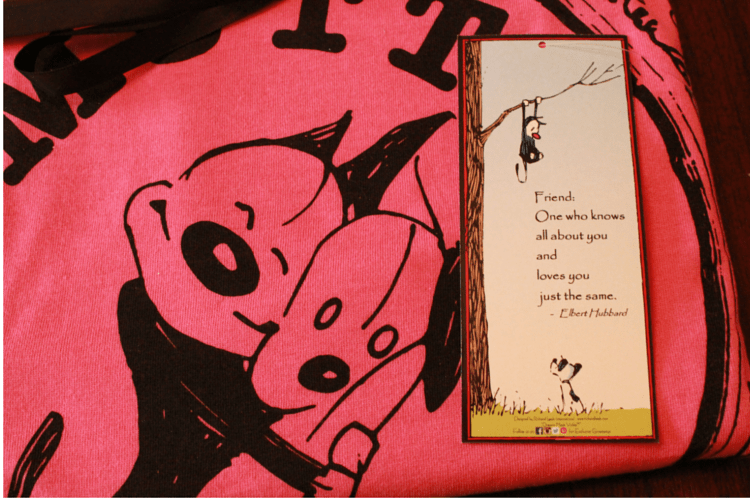 Don’t miss a chance to win the Mutts Winter Diaries and this cute Mutts shirt. McDonnell’s website, MUTTScomics.com, promotes his animals and earth-friendly philosophy. Consistent with McDonnell’s concern for the environment, all of the MUTTS books are printed on recycled paper. He and his wife Karen happily reside with Amelie, their rescue Jack Russell terrier, and Not Ootie, their formerly feral cat. Through the Mutts Winter Diaries, McDonnell, continues to spread his message of loving all living things and protecting the environment. And I can’t think of a better way to spread this message to kids than through the fun loveable comics of the Mutts. You can follow the Mutts adventures on Twitter, Facebook and Instagram.